Scientists at the University of California, San Diego (UCSD), have shown how the extracellular environment surrounding a tumor can affect the ease with which cancer cells can metastasize to other sites. The studies, headed by Stephanie Fraley, Ph.D., professor of bioengineering at UCSD’s department of bioengineering, showed that cancer cells placed in a 3D matrix of high-density collagen, but not low-density collagen, develop structures that resemble blood vessels and express a characteristic gene module, which in a number of different human cancers was found to be predictive of metastasis and patient survival. The vast majority of cancer deaths are caused by metastatic tumors, which occur when cancer cells from the primary tumor break away and migrate to other body tissues. In order to metastasize, the migrating tumor cells must first push through the extracellular matrix surrounding the primary tumor and reach either the lymph or blood vessels. What hasn’t been clear to date is how the structure of this extracellular matrix—and particularly the organization of collagen within it—may help or hinder tumor cell migration. In the high-density collagen matrix, the migrating cancer cells also switched on a specific set of genes, or gene module, and started to form interconnected network structures that resemble blood vessels. This is similar to a phenomenon known as vascular mimicry, which is seen in some patients’ tumors, and can be associated with aggressive forms of cancer. The gene module, which they called collagen-induced network phenotype, or CINP, was “enriched for migration and vasculogenesis-associated genes,” the authors note. Importantly, the behavior of cancer cells in the 3D collagen matrix isn't mirrored when they are grown in a petri dish. “It's critical to have the cells surrounded by a 3D environment that mimics what happens in the human body,” Fraley added. 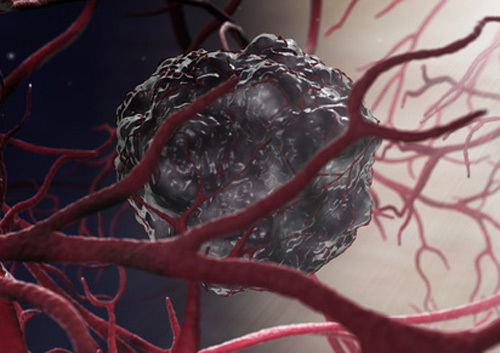 Searching through clinical tumor gene expression and histology databases, the researchers also found that the same cancer cell gene module that was switched on by the migrating cancer cells in their 3D matrix studies was predictive of patient survival and metastasis across nine different types of cancers, and was also linked with a vasculogenic mimicry phenotype. It's not unreasonable to suggest that the channels built by the malignant cells aid blood flow to tumors. Researchers have speculated that this may make it easier for cancer cells to spread to distant sites. One of the next steps will be to look for targets that can prevent cell transformation.